On Monday April 1, 2019 the Supreme Court decided the case Bucklew v. Precythe with the five conservative justices in the majority and the four liberals in dissent. To some including legal scholar and CNN analyst Steve Vladeck, this ruling ushered in a new conservative Court without the moderating anchor of Justice Kennedy. Going even further, Slate’s Mark-Joseph Stern referred to the decision as “beyond appalling” while Think Progress’ Ian Millhiser described the ruling as “the most bloodthirsty and cruel death penalty opinion of the modern era.” This decision at very least separates this nascent Court like never before as for the first time, these justices divided along ideological lines in a highly divisive case dealing with civil liberties (the justices also split 5-4 along the same lines in the immigration detention case Nielsen v. Preap). By focusing on these decisions, along with some of his other rulings including his dissent in the abortion case June Medical v. Gee, Kavanaugh can easily be characterized as another justice on the far right who will inevitably push the Supreme Court into a conservative era perhaps like never seen before. Furthermore, it would be surprising to find Kavanaugh on opposite sides of an abortion or death penalty decision from his conservative counterparts. That said, his first set of votes on the Supreme Court present a picture that may (1) differentiate him from some of the other conservative justices and (2) help us understand where exactly he fits in the Court’s ideological spectrum. This post uses data on current justices first sets of cases when they joined the Supreme Court to set a baseline for comparison to Kavanaugh’s votes thus far in the 2018 term. Thomas, the justice currently on the Court the for the longest time, was in the Court’s majority 22 times and in dissent four times in his first set of decisions in orally argued cases (to track Kavanaugh the cap was set to 22 decisions, yet all decisions made on the same day as a justice’s 22nd were incorporated into this analysis). 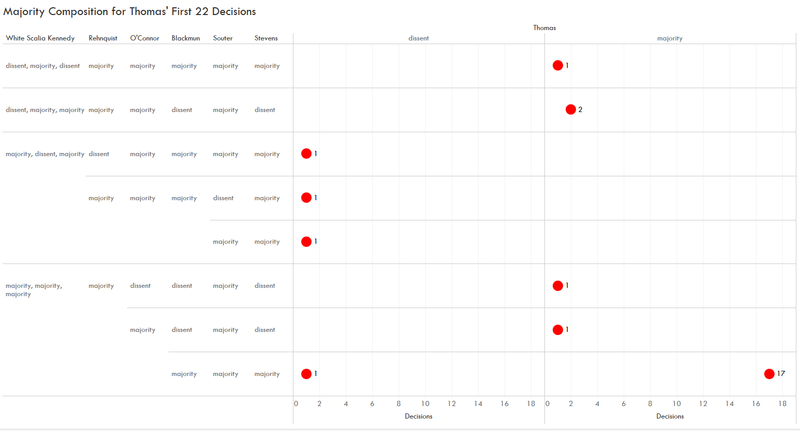 There were eight Court compositions in Thomas’ first set of decisions (note that in these graphs when vote spaces are empty and without an intervening line, these votes are the same as the votes above until the next line is reached). The Court was unanimous in 17 out of the first 26 cases where Thomas voted. Thomas voted most closely with Scalia as the only case where their votes were not the same was in Dawson v. Delaware where Thomas was the lone dissenting justice. 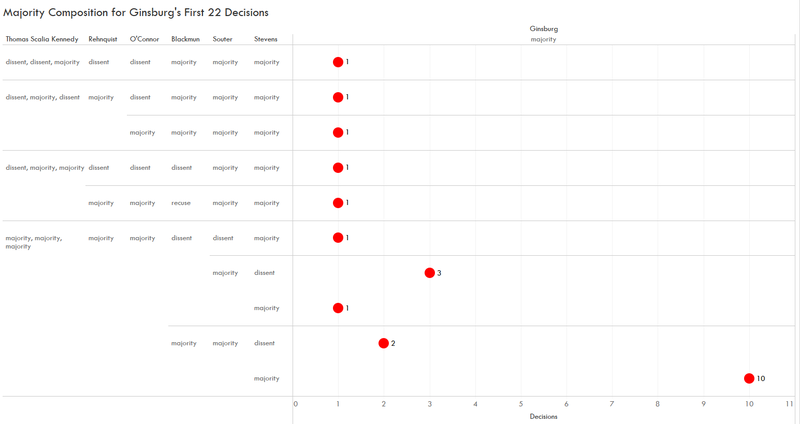 On the other end of the spectrum, Thomas and Blackmun voted in divergent directions in nine of these first 26 decisions and Thomas and Stevens voted opposingly in eight. Thomas’ early voting decisions already placed him towards the right edge of the Court ideologically. The next justice to join the Court was Ginsburg in 1993. Ginsburg is the only sitting justice that was in the majority in every one of the first set of cases she heard on the Court. Fewer of Ginsburg’s first set of cases were decided by a unanimous Court than Thomas’ with ten. Also unlike Thomas who had no 5-4 decisions in his first set of cases, Ginsburg had two. She authored the first, Ratzlaf v. United States, which dealt with criminal bank fraud. The majority in that case was ideologically mixed with Stevens, Kennedy, Scalia, and Souter along with Ginsburg. Kennedy authored the second, United States v. James Daniel Good Real Property, which examined forfeiture rules for property associated with criminal violations. Ginsburg was in the majority of that decision along with Kennedy, and the liberal justices Souter, Stevens, and Blackmun. Focusing on voting relationships, at one end of the spectrum Ginsburg voted in the opposite direction of two justices – Blackmun and Thomas — five times. Contrastingly, she was closest to Souter who only voted once in the direction opposite of her. With these pictures of Ginsburg as with Thomas, we already begin to see dimensions of their voting behavior with these early sets of cases that portend how they will decide cases, and which justices they will often side with, along their tenure on the Court. Fast-forwarding to 2005 we next look to Roberts first set of decisions on the Court. 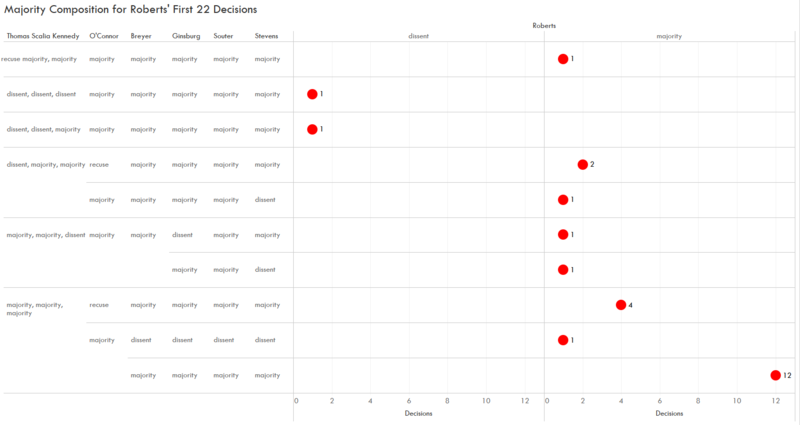 Roberts was in dissent twice and in the majority 23 times in his first 25 decisions. He voted on the same side as Scalia in each of these decisions. He voted in the opposite direction of Stevens most often with five such instances. Roberts was also involved in two 5-4 decisions in his first set of cases. He was in the conservative majority for the first, Brown v. Sanders, which also ironically an 8th Amendment capital punishment case, along with Scalia, O’Connor, Kennedy, and Thomas. Roberts was in dissent in the other case, Central Va. Community College v. Katz, which looked at sovereign immunity as a defense in bankruptcy proceedings along with conservatives Scalia, Thomas, and Kennedy. These decisions early in Roberts’ career on the Supreme Court already aligned him with the more conservative justices and placed him in opposition to the Court’s liberals. Now focusing on Trump’s nominees to the Court, the timing of Gorsuch’s nomination differed a bit from the other justices previously described as he began his career on the Court towards the end of a term rather than at the beginning. Gorsuch dissented four times in this set of decisions while he was in the majority on 20 occasions. At both ends of the spectrum, he voted on the opposite side of liberal justices Breyer and Sotomayor eight times while he was only once on the opposite side of a vote from Thomas. Since Gorsuch began his work on the Court towards the end of the 2016 and the Court tends to decide its more contentious cases towards the end of its terms, his first set of decisions involved more 5-4’s than any of the other justices with five. From the 2016 term, he was in dissent in McWilliams v. Dunn along with conservatives Alito, Roberts, and Thomas. In the second 5-4 decision he was in a conservative majority along with Kennedy, Roberts, Alito, and Thomas in California Public Employees’ Retirement System v. ANZ Securities, Inc. The majority composition was the same for Court’s 5-4 decision in Davila v. Davis. At the beginning of the 2017 term he was dissent in Artis v. District of Columbia along with conservatives Thomas, Alito, and Kennedy and he authored the majority opinion in Murphy v. Smith which was joined by Roberts, Alito, Thomas, and Kennedy. In Gorsuch’s case, we can see his conservative contours taking shape with this early set of decisions. Kavanaugh’s first set of decisions places him to the right of the Court, but he doesn’t align with the right to the same magnitude as some of his more tenured colleagues on the Court. Kavanaugh aligned most closely with Roberts as they both voted in the same direction in all but one of Kavanaugh’s first set of decisions. After Roberts though, Kavanaugh voted in the same direction as Alito in all but two instances and Breyer in all but three instances. This places Kavanaugh in an interesting space that might, at least initially, not be as far to the right as some of his conservative allies on the Court. As previously mentioned, Kavanaugh participated in two 5-4 decisions thus far. In both Nielsen and Bucklew, the Court split along ideological lines with Roberts, Alito, Thomas, Gorsuch, and Kavanaugh in the majority and Kagan, Ginsburg, Sotomayor, and Breyer in dissent. These decisions also show the potential for a strong conservative majority when all five of the conservative justices’ views are aligned. To examine Kavanaugh’s voting alignments at a more granular level, we can look at his agreement levels with each of the individual justices. The justices are split into the liberal and conservative sets. The figures show when Kavanaugh was in the majority or dissent on the X-axis, and when each of the other justices were in the majority and dissent on the y-axis. 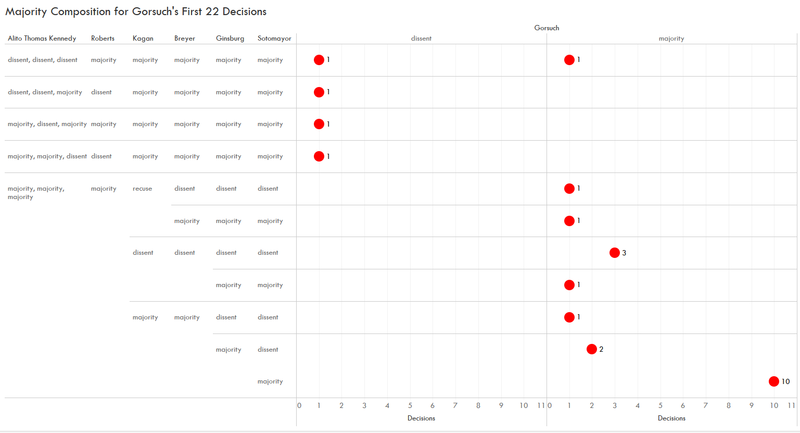 The justices’ votes are aligned when they are both in majority or dissent (quadrants four and two) and they are not aligned when one is in majority and the other is in dissent (quadrants one and three). Kavanaugh voted along the same lines as Breyer more often than with any of the other liberal justices on the Court at almost 86% of the time so far this term. He then voted alongside Kagan in 81% of the decisions in which he participated. Kavanaugh next aligned with Ginsburg and Sotomayor both just over 76% of the time so far this term. These percentages of association with the liberal justices become even more meaningful when compared with the same figures for the conservative justices. Kavanaugh voted on the same side as Roberts more often than with any of the other justices at approximately 95% of the time. He voted alongside Alito the next most at 90% of the time. The somewhat surprising finding is that he voted along with Breyer more often than with Gorsuch or Thomas. He voted along with Gorsuch in 80.95% of his votes which is the same frequency of voting alignment he shared with Kagan. 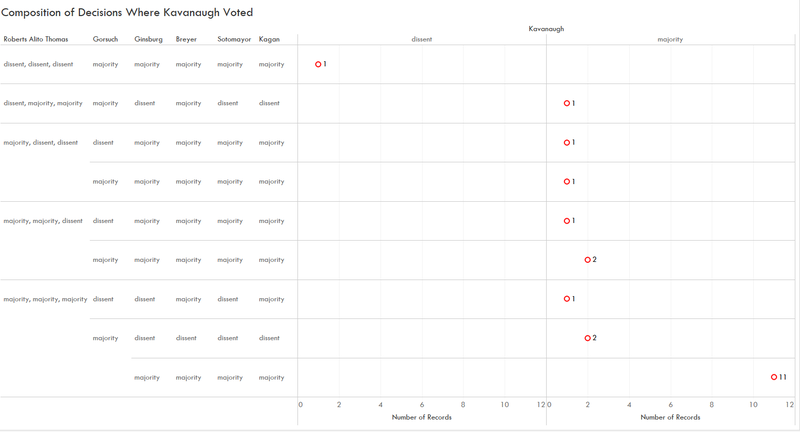 Kavanaugh actually voted equally least frequently along with Thomas, Ginsburg, and Sotomayor, all at just over 76% of the time. While Kavanaugh is perhaps a milder conservative than expected part of the way through the 2018, he sided with the conservatives in the two cases where his vote made the biggest difference – in Bucklew v. Precythe and Nielsen v. Preap. It will not be surprising to see Kavanaugh side with the conservatives in these highly contentious cases, but it will be interesting to see if Kavanaugh and Roberts (whose possible shift to a more moderate position on the Court was discussed in a recent post) make up the more moderate end of the conservative spectrum with Gorsuch, Alito, and Thomas more towards the edge of the continuum. Voting composition figures for the remaining justices’ first set of votes can be found below. Previous Post Is the Court Tracking Right or Roberts Left? Interesting viewpoint. Either way, thanks for posting!